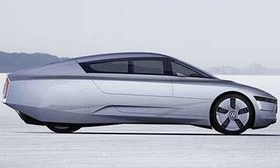 Volkswagen's 1L concept uses a two-cylinder turbodiesel engine. Volkswagen's latest vision of a two-seat car that gets 238 mpg (1 liter per 100 kilometers) is set for a debut at Frankfurt this week. But photos of the concept have been published in Germany. VW's L1 concept makes extensive use of carbon-fiber material to keep the vehicle weight at 500kg -- half as much as the VW Polo -- according to German national newspaper Bild. It posted information and photos of the car on its Web site on Sunday. To help minimize aerodynamic drag, the passenger sits behind the driver. The L1 concept also uses small cameras in place of rear-view side mirrors. Cool-air ports for the engine and cabin ventilation open and close automatically. The rear wheels are covered by skirts to smooth airflow. Power comes from a two-cylinder 36hp turbodiesel engine, mated to a seven-speed dual-clutch transmission, the report says. Despite the concept's name, this powertrain consumers nearly 1.5 liters of fuel per 100 kilometers, according to Bild. It has CO2 emissions of 39 grams per kilometer. The L1 measures 3800mm (149.6 inches) long. There is a small trunk witha 50-liter luggage capacity. The roof opens like a canopy to let people in and out of the car. The design of the L1 is somewhat similar to a 1-liter prototype that VW Chairman Ferdinand Piech drove in 2002.